Group Discussion Ideas > Economic GD Topics > Has Reliance jio changed the telecom sector of India? The huge LTE mobile network operator Reliance Jio Infocomm Limited is a wholly owned subsidiary of Reliance Industries. It is the only “VoLTE” company in the country that provides 4G networks without any 2G or 3G network support. Since Jio has entered the telecom market, it has kept on growing. Low costs and offers have attracted customers all over the country in bulks. With Jio coming into play, the data costs and the call costs has reduced drastically. This is one of the primary reasons for attracting millions of customers in just a few months. After the introduction of Jio, other telecom companies too had to reduce tariffs and had to think ways to improve efficiency. This is a big plus to telecom industry as well as consumers. As Jio services support 4G networks only, the demand for 4G enabled smartphones has also increased. According to data by IDC and Morgan Stanley Research, 95% of the smartphones sold in the country in the first quarter after Jio launch were 4G-capable. India saw an exponential rise in the consumption of online data after Jio launch. Statistics says that India consumes over 100 crore GB of data each month with video streaming of 165 crore hours per month. Voice calls for over 250 crore minutes each day are also recorded. 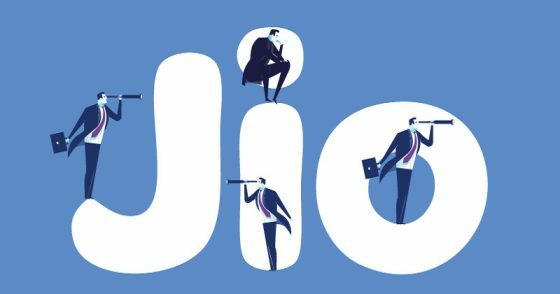 Jio has claimed that Facebook and Google have added over 70 million users since the Jio launch. The subscribers of Jio are increasing at alarming rates. Jio claimed the subscription of 100 million users in less than 6 months of operation. This is creating a tough competition for other telecom service providers like Vodafone, Aircel, Idea etc. Jio became the country’s biggest provider of broadband Internet too. According to the government’s TRAI SpeedTest portal, Jio has consistently achieved top internet speeds in India. The launch of Jio Phones will be the next big bomb for the telecom industry. Its 4G-VoLTE feature along with free calls, web surfing supports etc will make it another success. According to the company, the phone received over 6 million pre-booking requests in one day. The telecom industry had been facing huge debts of around 4.5 trillion rupees yet it continues to carry a debt of around 3 trillion rupees. All other telcos like Airtel, Vodafone incurred losses because of Jio. In spite of the widespread of Jio connections, and free access of internet, illiteracy continues to be high in our country. In rural and village or remote areas of the country, the 4G connectivity has not reached yet. Those people are still deprived of the Jio-failities. The launch of Jio phones can also be a tremor for the mobile manufacturer industries. They might be facing huge losses. The launch of Jio and its plans has satisfied its customers greatly. Other telecom industries, mobile manufacturers, etc might be at loss but the customers are utilizing low-cost internet services and calls at their best. Jio has huge plans in the healthcare and education sector, where it wants to capitalize on Prime Minister Narendra Modi’s Digital India campaign. yes,it is make great helpful for student who has less amount of money because of family financial problem,by using these jio network they can earn money at home by part time job at free time and also they used for their subject doubts. And due to low costs of Internet 399 INR per 80>days and not 1GB per month😕😕… 1GB per day..😱😱😱😱. Considering country’s growth point of view jio is contributing much to attain india as a digital nation..it has entered in the life of economically weaker sections also..the high tariff rates of other telecom sector never let each n every section of country to access the benefits of internet..but today my maid is having jio phone getting the benefit of low cost internet service..
Actually Jio Phones are made in India product as they are manufactured by LYF corporation which is Jio’s subsidiary company only. So the revenue generated due to sales of Jio phones will directly contribute to India’s economy. Thanks to Jio, other telecom companies to reduce tariffs and have to improve efficiency. This is a credit to telecom industry as well as consumers. But availability and sustainability are the main points. Other telecom providers like Airtel,Idea, Vodafone lost around 3000 crores. Idea cellular running in losses for last two quarters , if there is no healthy competition among companies, one company will lose its foothold in the nation and losses will be converted as NPA’s which will in turn affect common people. Most of these companies have lot of debt from banks. If banks are running in losses for long term we might face depreciation of growth. In future we might have a case where JIO has captured the entire market and chances of monopoly in telecom sector are very high. That’s a great analysis. Thank you for adding your views.